He was healthy, there were no complications, and he was also my third child, so it wasn’t like I hadn’t done this before. Little did I know in five short months my daily mantra with Ted would be “Please don’t let him die.” He was a baby who was in a hurry to do everything. He was sitting very early, crawling at four and a half months and pulling himself up on furniture at five months. In the January, when he was five months old, Ted got an ear infection. Again, he wasn’t my first so knew it would pass, but something changed. He was given antibiotics, about five courses in all, and the ear infection eventually cleared, but things weren’t right. My happy determined baby, was no longer happy. He cried and screamed for about 18 hours out of 24 every single day. After repeated visits to the GP over the next two months, having them roll their eyes at me, tell me my child was a naughty boy (he was five months old), being told a petechia rash all over his legs was nothing, I asked them to test for cancer. I was told that I was a really paranoid mum, who needed to lock my screaming baby in a room until he stopped crying. I decided to see a locum GP who didn’t know us. My mother’s intuition, my conscience, gut instinct, whatever you want to call it, it was screaming inside my head that my baby was dying. He wasn’t fine and I had to do something about it. Ted had reverted in a matter of weeks from crawling and cruising furniture, to not being able to sit up and couldn’t cope with being touched as he would scream in pain. He wouldn’t feed and cried non-stop. The locum told us his liver and spleen were very enlarged and his heart was racing, so she thought he was anaemic. 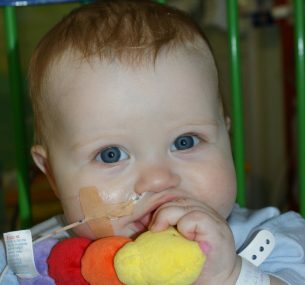 He was exclusively breastfed at this point, and I was healthy, so I knew he had leukaemia. We had a blood test and the nurse who took his blood gasped, as it was pink in colour and ran like water. She remarked “Gosh, he is a bleeder”. We were told the results would take a week, but I felt in my heart he wouldn’t survive another week without help. We went to Tesco afterwards and I remember having Ted in the shopping trolley. People would smile at him, and anyone who looked our way I would tell them “His name is Ted and he is a lovely baby”. I knew he was dying and I needed people to know he existed. I didn’t want him to not have made an impression in life. It seemed so pointless and cruel. We didn’t have to wait a week for the results, within two hours the phone rang and our lives have never been the same since. 90% of Ted’s blood cells were cancer cells. 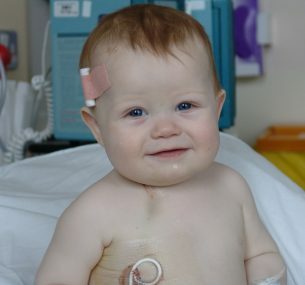 He had infantile acute lymphoblastic leukaemia, which is only found in children under 12 months old. The five year survival rate for this is 20-50%. Ted was considered lucky as he was given 50% chance, when he had an initial good prednisolone response. He had a minimal residual test, which was a new thing back then, and treatment began. He was put on a strict treatment protocol, and had four blocks of intensive treatment, followed by 18 months daily maintenance chemotherapy. Unfortunately, the chemotherapy instantly attacked his stomach and bowel, which meant he wasn’t able to eat, and nappies were put through their paces with the bowel damage. Ted was always neutropenic, and always had an infection. We would be in isolation all the time which meant we watched life happen outside his window. It became incredibly isolating for Ted and us. You are entered in to a world where choices are unbearable. Normally having a central line removed takes about 40 minutes, and you have other parents there to chat to whilst you wait. This was 2am, there weren’t even staff present, it was isolated and eerie, and I was completely alone. It was the longest two hours of my life. Ted fought back, time and time again with infections, and whilst he still has after effects of the chemo damage, he is still fighting back. He suffers from audiological illusions which means he hears people talking behind him, when nobody is there. They don’t talk to him, that is different, but he can hear them. The damage to his ears was caused by the chemo. He has processing difficulties and autistic traits, a lot of oncology children do, from treatment. He still has things going on with his stomach and bowel, but he has greatly improved over time. In July this year he was finally put on 12 monthly appointments, he is eight years off treatment, and 10 and a half years since diagnosis. That is a long time for a child to be medicalised. When Ted finished his treatment, he was handed a little plastic medal with “Winner” on one side and “Made in China” on the other. I was so despondent in that brief moment, as it no way represented the true journey a child takes with cancer. These medals are 4 for £1 in any good supermarket! 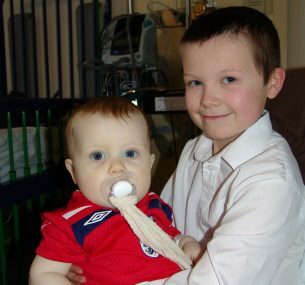 We had already set up a registered charity to promote the signs and symptoms of childhood cancer, as we weren’t the only family who struggled to get a diagnosis. We developed the UK’s first signs and symptoms awareness card, as at the time there was nothing available. 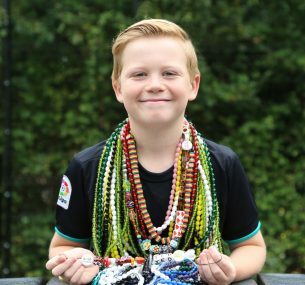 We decided through this we would bring the Beads of Courage programme to the UK to support the mental health and wellbeing of children, siblings and family through the amazing arts in medicine therapy programme Beads of Courage. We work in partnership with Beads of Courage.inc in America, but we are registered charity Beads of Courage UK. 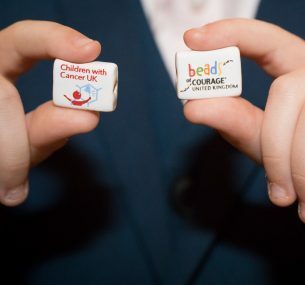 We are utterly thrilled to be working with Children with Cancer UK from January, as they will fully fund the oncology Beads of Courage programme for 2019. 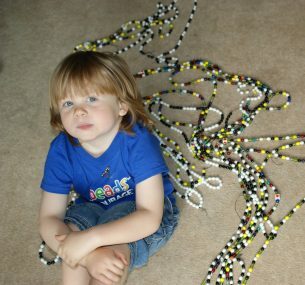 We are very family motivated at Beads of Courage UK, and our focus is improving the lives of children with cancer. We all felt that Children with Cancer UK also fit our ethos, and together we will make wonderful things happen for oncology families. I never would have imagined years ago when staying at Great Ormond Street Hospital, all those times I would go outside to breathe in a little hustle bustle and look across to the what was then Children with Leukaemia offices, that one day a charity I helped to co-found would be working in partnership with them to improve the lives of so many children.